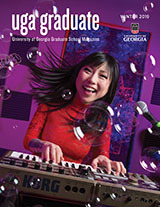 Each year, the Graduate School offers many professional seminars for UGA graduate students. The seminars cover strategies for managing the professional, academic, and personal demands of life as a graduate student and offer helpful advice for students’ subsequent career search. Registration is required to attend these seminars which are held at the Student Learning Center. The seminars, which range from an hour to an hour-and-a-half in length, are available in three formats: Video, 5-Minute Mentor Summary (perfect if you don’t have time to watch an entire video or if you want a printable version of a seminar’s main points), or Podcast. The Graduate School encourages all students, whether at UGA or other institutions, to take advantage of the seminars, in person or online. Students are welcome to contact any of the lecturers with any questions regarding their presentations. They can be contacted through their respective departments, through the Graduate School, or found online in the UGA directory.